It was a rivalry made in basketball heaven. Their NCAA championship game changed college basketball and made March Madness a national obsession. Then they dominated their teams and their sport in the 1980s, on teams that fought year after year for the NBA championship. And, to this day, even in retirement, it's still Bird and Magic. And, their story is told their way in When the Game Was Ours by Larry Bird and Earvin Magic Johnson with Jackie MacMullan. Earlier this year, I reviewed When March Went Mad, the story of the college year that led to the most famous NCAA Final game. But, I certainly didn't know that Bird and Magic were teammates at the World Invitational Tournament the summer before they played in that game. They admired the other player's skills, and the following February, they faced off - Larry Bird and his Indiana State team, and Magic Johnson from Michigan State, young men who stayed close to home in college, but caught the imagination of the nation in one game. And, basketball fans never let go as we followed them to the Celtics and Lakers, and watched their teams challenge each other year after year. This book captures the determination of both players, and takes them to their final years in basketball. It showed how they both studied the skills of the other player, wanting to best them, and eventually found a way, through that admiration, to be friends. Bird was there for Magic when he announced he had the HIV virus. Johnson dragged Bird on to the Dream Team, where they were co-captains, bringing the gold medal back to the United States. If you're a basketball fan, you probably know the basics of their story. The book doesn't go too deeply into personal feelings, if that's what you're looking for. But, if you want the story of two basketball players, and the years they dominated their sport; if you want to read about two men who challenged themselves, their teams, and each other to greatness, try this book. Nowadays, there is Kobe and King James, Dwayne Wade. The years of Michael Jordan are over, but he dominated the sport by himself, with no great rival. But, just as they made March Madness a must-see event, Bird and Johnson focused the sports world's attention on pro basketball, and changed the sport forever. This is a satisfying story, for any fan who wants to read about men who were passionate about basketball, and winning. When the Game Was Ours allows two Hall of Fame players to acknowledge that, in the minds of the fans, and the world, Larry Bird and Earvin Magic Johnson will always be together. 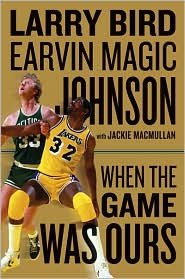 When the Game Was Ours by Larry Bird and Earvin Magic Johnson with Jackie MacMullan. Houghton Mifflin Harcourt, ©2009. ISBN 9780547225470 (hardcover), 340p. I always love books that focus on personal achievement--really inspiring! I'll check this one out. My son may enjoy it, too. Jim's waiting to read it, too, Elizabeth. In our house, I usually read the sports books first. Great review, Lesa. This sounds like a very good read. Thanks for this. You're welcome, le0pard13. I really enjoyed it. Hope you do! It sounds like I'm not the only reader who said, "hmm... last minute gift for the dear spouse/son." Thanks for the head's up, Lesa. I wouldn't have known about this book, but I bet Jon will love it! Yep, perfect last minute gift for the person who loves basketball, and basketball history. And, it's such a readable book. You're welcome, and I'm glad Jon doesn't read my blog, Clea!